Li Bai Cantonese Restaurant at Sheraton Towers in Newton has a new sister restaurant, Full of Luck Club, in Holland Avenue. It serves Cantonese cuisine with a contemporary spin. The two-storey 97-seat restaurant features classics from Li Bai, such as Hakka crispy Kurobuta pork belly ($18) and crispy aromatic duck ($35 or $70). Other dishes include Truffle Pepper Beef Claypot Rice ($16, photo 1, bottom) and Yuzu Char Siew Cod Claypot Rice ($16, photo 1, top). Full of Luck Club also has a Bao Bar window concept, situated near the Holland Village MRT station's entrance. It offers a selection of steamed and fried bao ($9.80 for two) for takeaway. 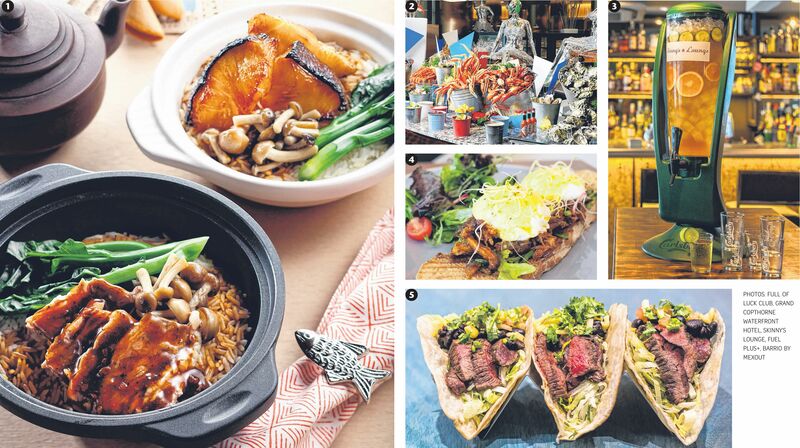 For dine-in, options include salted egg yolk prawn bao with lettuce, fried curry leaves, crushed peanuts and birds' eye chilli; and braised pork belly bao with lettuce, pickled lotus root, fried shallots, birds' eye chilli, coriander and crushed peanuts. Asian-inspired cocktails, wines, and craft beers from microbrewery Hong Kong Beer Company are also available. After a $17-million makeover, Grand Copthorne Waterfront Hotel unveils its revamped lobby with four new food and beverage outlets. The lobby, along with all-day dining buffet restaurant Food Capital (photo 2) and Tempo bar, will launch on Thursday. The third concept, southern-Italian eatery Grissini, will open on June 11, followed by Secret Chat patisserie in the third quarter of this year. At the 233-seat Food Capital, savour sashimi and sushi from the Japanese station, grilled meats from the rotisserie station and tandoori chicken from the tandoor. Sweet treats from the dessert station include teppanyaki- style ice cream with fresh berries. The buffet costs $52++ for lunch and $70++ for dinner. Kick back at Tempo bar with drinks such as the chendol-inspired #locotempo 61, a mix of pandan- infused rum, Malibu rum, coconut and gula melaka. Signature cocktails are priced at $22++ each. Show off your karaoke chops at Skinny's Lounge, a 60-seat American bar at Boat Quay, complete with disco lights, pool tables and a karaoke room for up to 10 people. The drinks menu includes Shady Pine's Highball ($15), American whisky shaken with citrus and fresh green apple juice; Daiquiri No. 1 (La Floridita style, $18), ice-blended young Cuban rum, Maraschino liqueur and fresh lime; and Gin Basil Smash ($18), London Dry Gin shaken with fresh basil and muddled lemon. Or gather your friends and order the Pimm's Cup ($200, photo 3), a cocktail tower with the classic summer cocktail of Pimm's No. 1, cucumber, fruit and topped with ginger ale. Pair your drinks with bar bites such as the nine-inch "Murican" Hotdog ($12) or jumbo soft pretzel ($10). Happy hours with tongue-in- cheek themes include Tinder Tuesdays, where couples who have met on the dating app get free drinks upon showing their matches as well as Ladies Disco on Wednesday nights, where every group of four women gets a free bottle of sparkling rose. Fuel up at Fuel Plus+ in Telok Blangah, the sister outlet to Refuel Cafe in Bedok Reservoir. Menu items include prawn and mussel fettucini ($17), pulled pork Benedict ($16, photo 4), soft shell crab curry ($18) and honey barbecue baby back ribs ($19). The drinks menu features Fuel Iced Tea ($5), latte ($5) and strawberry mint iced tea ($5.50). Mexican restaurant Mex Out has opened Barrio, a taqueria and crudo bar at 313@Somerset. The casual 70-seat restaurant offers dishes such as a vegetables "De la Cruz" burrito bowl ($12.40), carne asada tacos ($14.50 for three, photo 5), protein salad ($15.90) and breakfast burrito ($8.90). Its island bar serves sangria, draft beers, wines, house-made soft drinks and speciality coffee blends, roasted for Mex Out by Sarnies Cafe.